We’re radiating sunshine and good thoughts around the Owen homestead today. I went shopping and bought something NEW. I know that’s hard to believe. It was new stuff for the house. 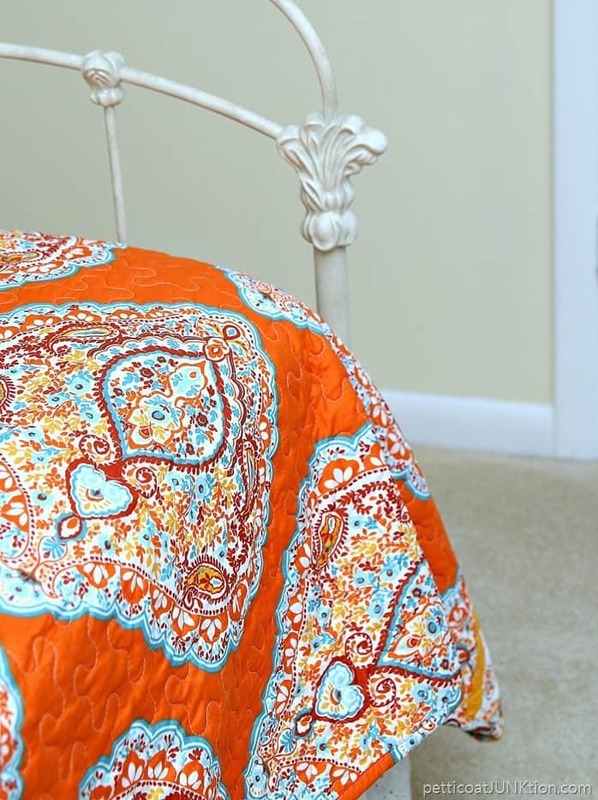 I didn’t plan to buy the new bedding but the turquoise and orange print had me at first sight. There is this store in town called Bargain Hunt (this is not a sponsored post) and I’ve been in to look around four or five times. I bought a couple of odds and ends for crafts on one trip but I think that’s it. I stopped in last week and bought this bedding for the granddaughters bedroom at our house. This is the quilt that’s been on the bed for at least 10 years. I still love it but was ready for a change. When I spotted this bedding set on the back wall of the store…..from the front door….I had to get a closer look. 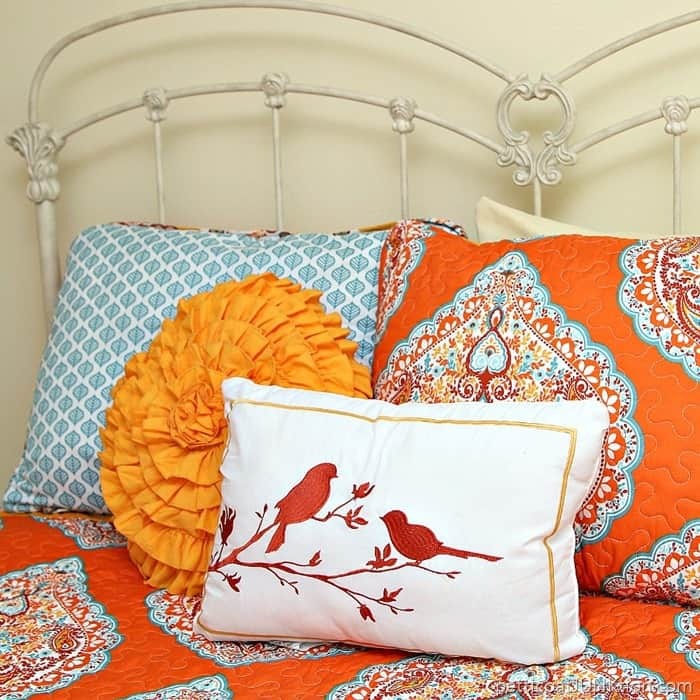 The set included the two reversible pillow shams, the yellow/orangy fluffy pillow, the bird pillow, and the quilt/comforter. The price was $49. I thought that was a pretty good deal. The color of the fluffy pillow and the colors of the birds threw me off. The colors looked kind of yucky while everything was in the bag. I thought “Well, I’ll take it home and if I don’t’ like it I’ll bring it back”. When I put the set on the bed the colors looked much better together. I like the turquoise and white reversible side of the shams too. The quilt is also reversible. 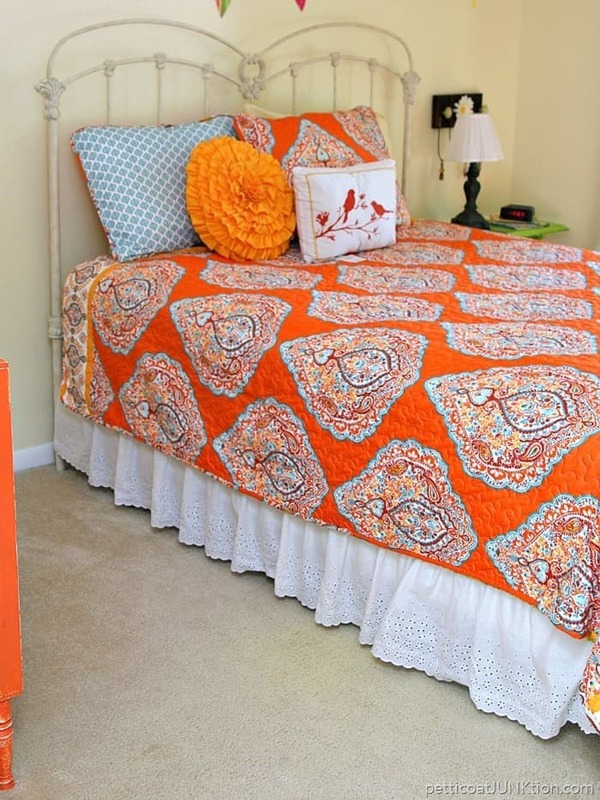 The white eyelet bed skirt from the previous set works with the bedding perfectly. Win-Win. 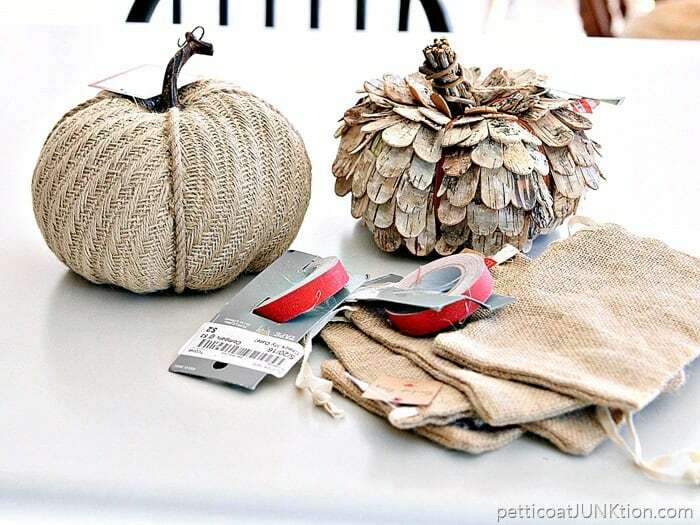 I also bought the burlap pumpkin, the wood pumpkin, 6 small drawstring burlap bags, and two rolls of red sticky glitter ribbon…for $5. It was all on clearance. I think I’ll stop in the store a little more often. But not too often. Do you guys have a Bargain Hunt Store in your area? 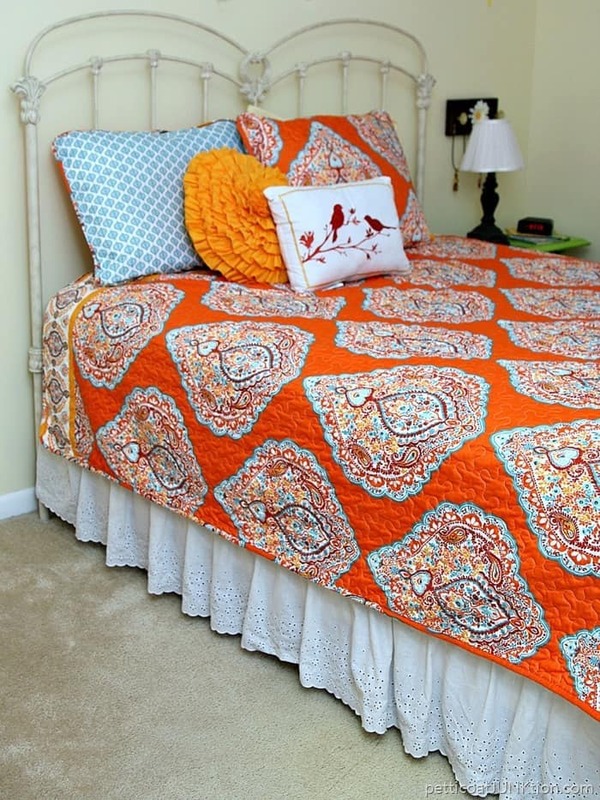 What do you think of the new bedding…too much color…or just right. Don’t like it at all?? That’s okay too. See you guys next week. Have a great weekend. 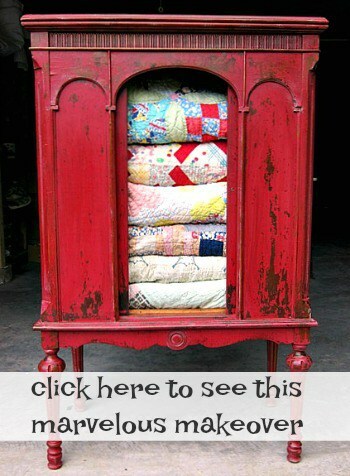 « How To Paint Vintage Furniture And What Fabric Was That? First of all, I am making some of those pumpkins~they are adorable! I love the white, I’ve never been a big fan of orange pumpkins (I guess that makes me a little weird since the rest of the world seems to, lol). But you just gave me the pumpkin solution I needed! Thank you! And your granddaughter’s bedding is perfect! I say that because it looks almost just like mine!! But I used coral instead of orange, but all of the colors go so well together, love the blue pillow sham! Love the turquoise, orange and burlap together. Thanks for linking up your post at the #HomeMattersParty this week. Oh I just adore quilts. I have one from each Grandma as well as a couple of store bought quilts that I literally don’t use enough because I love them so much! That orange is absolutely to die for. Also, we would love to have you at our new Wednesday “To Grandma’s House We Go” link party. I love the new quilt. Isn’t it amazing the impact that bedding has. I’m also incredibly jealous of your gorgeous bed frame. Truly stunning transformation. Visiting form Share Your Style link party. I love turquoise and orange! I use it quite often in my home and I love the bright color with white backgrounds. Looks wonderful to me! Great update. I too, love the orange & turquoise, too bad hubby don’t. I think it brings a lot of life into the room. Thanks for sharing. Truly is my dream look for the bedroom. Keep the great ideas coming along with your great DIY instructions. Have a great day. oH BE STILL MY HEART! Turq and Orange are my faves!!! Wish I could post a picture of mine…..! Love it. The pillow is adorable. So gorgeous, I did my popup camper in similar colors. I was so afraid when I started because I’m a neutral color type, but when I saw that combo I was thrilled. Needless to say, those colors are now my favorite! The bird pillow is so perfect for it also. 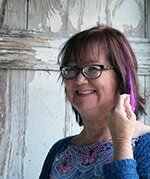 I look forward to your emails every morning, I’m a newbie to your blog, LOVING IT!!!!!! We do not have a bargain. Hunt here ! But we are starting to see new , new to this area anyway .REstaurant Chains , like Golden Corral, Cracker Barrel chick fil- it’s big here. Most people. Go to the Buffett s . By the way we are in Las Vegas. Nv. 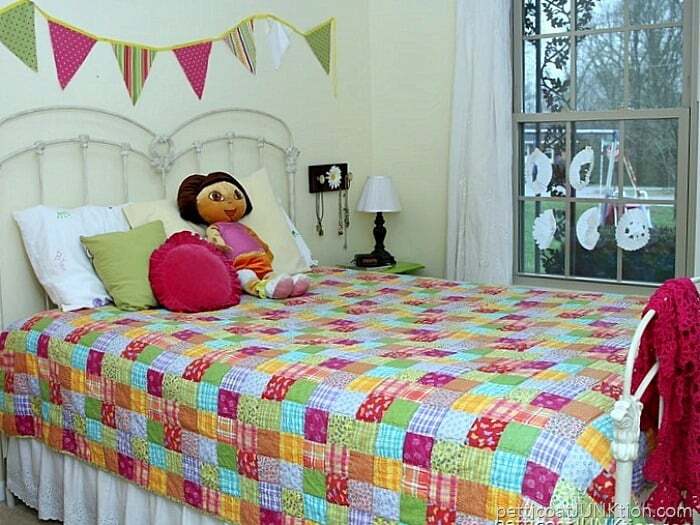 I loved the “old quilt” when I first started reading your post, but when I heard you were tired of it, I thought, “Oh, heck, I like the oranges, turquoise, and fuchsia together!” Anyway, the new bedspread is fine, too, and the burgundy (?) color in the spread matches the bird pillow – at least from my computer screen! I like the pillows you’ve got on the bedding. It works great. Love the pumpkins! Did you have a plan for the tape when you bought it? Red for Christmas??? I love the pop of color and I LOVE the bird pillow! Good find! Love the bedding! One of my favorite color combinations! Looks awesome with the white bed skirt & the metal bed! Wish we had a Bargain Hunt store here but alas we don’t. Love the pumpkins too! Bet your granddaughter will love the new bedding. So bright and colorful.